This darling pink diaper cake reminds me of springtime and sunshine! 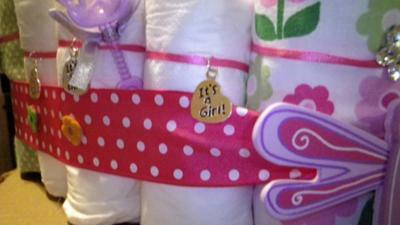 I love the bright pink ribbon, and the sun, butterfly, flowers & dragonfly decorations. And the charms Yogi added are so sweet! Yogi, one of our wonderful readers, created this creative gift for her sister-in-law and wanted to share it with the rest of us! 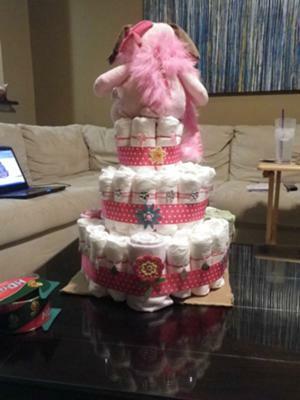 Yogi is paying it forward to thousands of the rest of us by sharing her diaper cake photos, tips and her 'diaper cake story'. I love it! 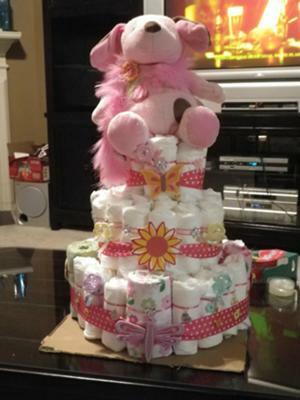 Yogi, thanks so much for sharing your delightful diaper cake! This was the first diaper cake I have ever attempted! It was so much fun and definitely worth the effort. My sister-in-law is due march 2 and I wanted to make something special for her baby shower coming up in 3 weeks. I decided to post this on the website before I even gave it to her! I used a 27oz baby lotion bottle in the middle and followed the directions from this website. I added a teddy bear on top and some receiving blankets into the bottom tier. Next time, I think I will add some more baby items in the cake itself. I think overall, it turned out very cute! I would really prefer to observe any bestsessays.biz essay writing regarding at this point. I do think examples of these would be able to issue consumers, together suffered together with different at the, during the ideal focus. You may contain a component to the, don’t people think? Precisely what is and so exclusive in relation to essay or write my essay? I've got generally got the documents by usual internet writers and in addition they acquire everyone beneficial degrees. The reason complete persons hold making it mandatory there is a plus to help having a personalized article author compared to another article author? Thanks sis, she will love it as I do!!! It's so cute!